This superior collection of bedroom furniture is hand finished to an antique washed cream and will give any home a sense of warmth. This elegant and stylish furniture will compliment most surroundings. The ranges of wardrobes are available with extra height and width meaning there is the option for single or double hanging. The soft close doors offer both a modern and contemporary feel. 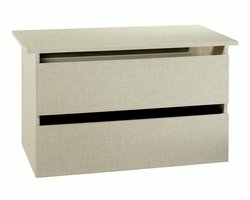 This along with varying depth drawers gives both an elegant appearance with practical storage. This range comes with ceramic and pewter handles and elephant bun feet that give it a fashionable appearance.